You get a pie! You get a pie! You get a pie! Everybody gets a pie! Somehow, 2018 turned out to be the year of pie. This year, The Kid has been busier than the Pillsbury Dough Boy making pastry. I love cake. It’s one of my two favorite foods. And cake can be homey and comforting; coffee cake and Bundt cake are two tasty examples. But there’s something about pie. It’s never fancy. You never feel underdressed in front of pie. You never feel judged or challenged by pie. Cake is a delicious, delicious show horse. Pie is a puppy. 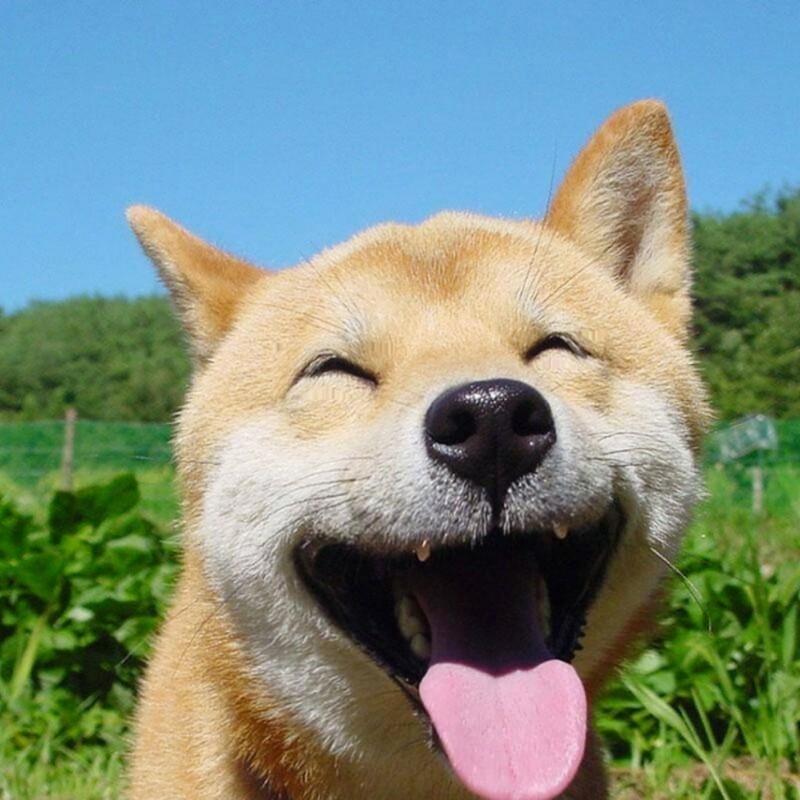 Pie’s just happy to be there. My dad was raised in Depression-era Pennsylvania; home of odd and obscure confections like shoofly, Montgomery, and Tears-On-Your-Pillow pies. But I think his all-time favorite pie is raisin pie. Which I think we can all agree, sounds both bizarre and unappetizing. But we all have some insane childhood treat that we hold dear and would fight to both obtain and defend. Mine is Goober Grape. There is always a jar in my kitchen. I eat it by the stress-obliterating spoonful. But, back to the year of π. For my dad’s birthday in March, The Kid made him a raisin pie. He loved it. Then he and my spawn put their heads together and decided that for Father’s Day, The Kid would create a new pie for her fruit and nut-loving Grampa: a dried cranberry pie with a granola crust. 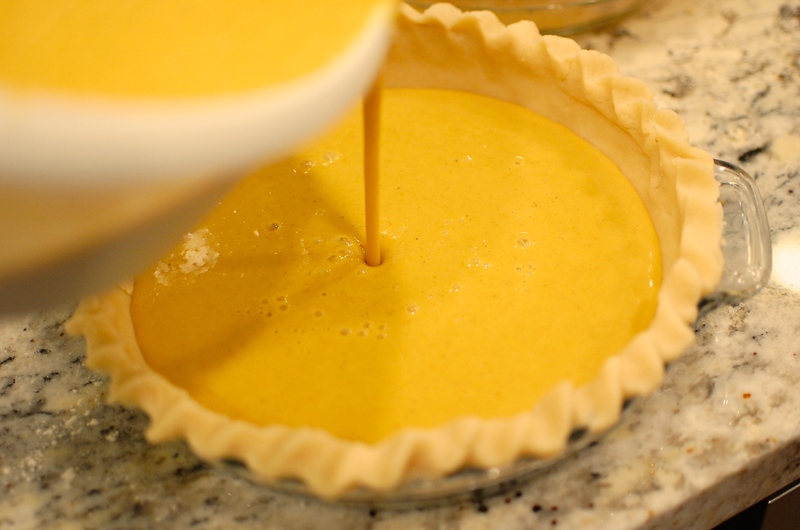 For my mom, there was no question; it would be her absolute favorite, egg custard pie. 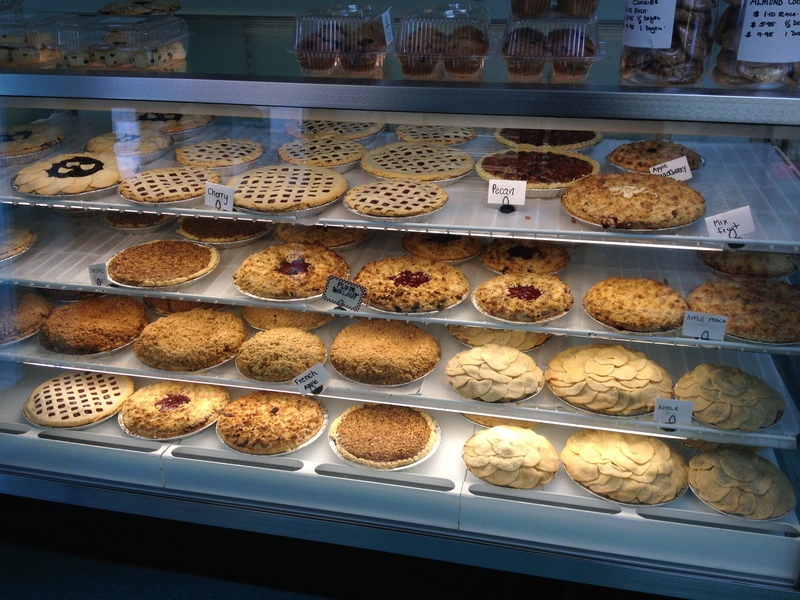 Last weekend we went to Greensboro bearing pie. Preheat oven to 400 degrees. 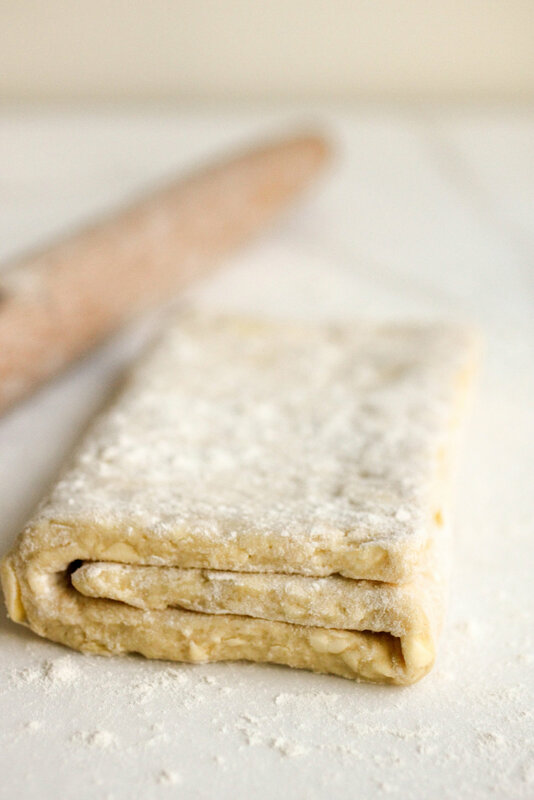 Mix all ingredients together and pour into unbaked pie crust. Bake for 35 minutes or until uniformly puffed and lightly browned. Let cool completely before slicing. Refrigerate leftovers. 2 tablespoons chilled Bourbon (Alcohol adds flavor and does not produce gluten in the flour. 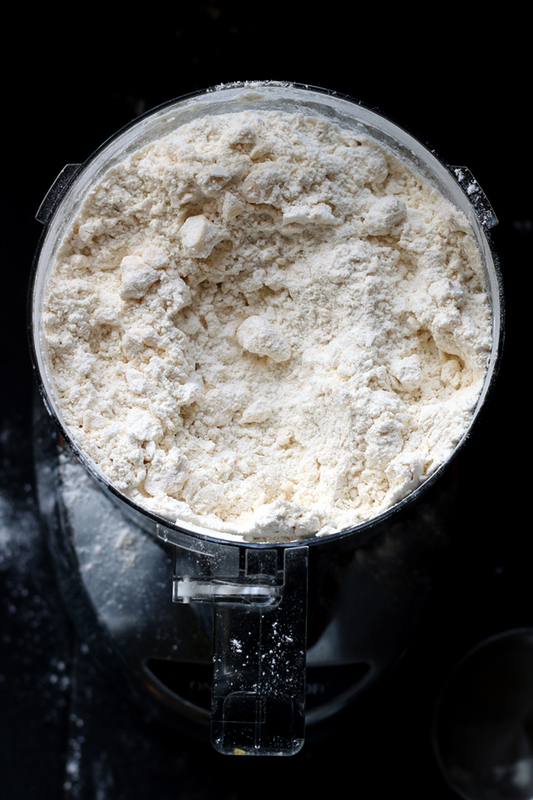 Gluten is what makes bread dough stretchy [good], and pie crust tough and rubbery [very bad]) Put all ingredients into food processor. Pulse until it comes together in blueberry-sized pellets. Turn it out onto floured surface and knead just until it comes together. Gently shape into two discs and refrigerate for at least two hours or up to four days, or freeze, well-wrapped, for up to six weeks. When you’re ready to use, roll out into square. Fold it into thirds, then fold in half. This will increase the flakiness of the baked crust. Roll into 9-inch circle, press into pie pan. Thoroughly chill before filling to decrease shrinkage during baking. Then fill and bake according to instructions. So, if you, Gentle Reader somehow find yourself also observing the year of pie, you could do much worse than using this champ of a pie crust—it’s truly the best one I’ve ever had. And I will keep you up-to-date on our very own annus scilis. Thanks for your time.